Not enough gas, not enough ammo or not enough time. Not enough to cross the Rhine before the enemy closes all the gaps. You need to form the bridgehead before others do. That’s the only way to Victory and your personal glory. 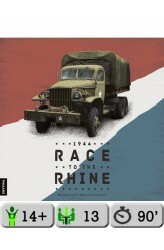 1944 Race to the Rhine is a new game experience. You can’t win this game without proper planning. Your tanks need gas to move and ammo to fight. But don’t forget to feed your GIs. So what would be your transport priority? Will you follow General Patton’s strategy to discard ammo in order to bring additional fuel barrels along to move boldly forward? Would you risk your prestige and gamble on Market-Garden as Field Marshal Montgomery did? Would you cross the Rhine more quickly than General Bradley did, with the help of your hard work and a little luck? 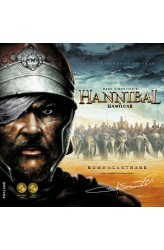 “..
Hannibal & Hamilcar: Rome vs Carthage is a 20th anniversary edition of the classic Hannibal: Rome vs. Carthage, an asymmetrical card-driven game for 2 players set in the time of the epic struggle between ancient Rome and Carthage. It presents a conflict between two superpowers of Antiquity from the classical Clausewitzian perspective, according to which a power only reverts to military operations when there is no other way to achieve political dominance. Hannibal was designed by the world-renowned Mark Simonitch. This 20th Anniversary Edition of the game includes new scenarios and variants. Certain game mechanics have been streamlined, while producing exactly the same game results as the golden classic. 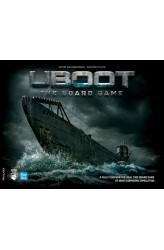 Hannibal has won numerous awards (including the Golden Geek Best ..
U-BOOT: The Board Game is a fully cooperative, real-time tabletop game of WW2 submarine warfare, designed by Iron Wolf Studio. It allows 1 to 4 players to assume the roles of the Captain, the First Officer, the Navigator, and the Chief Engineer on board of a type VIIC U-boat. The game is driven by a companion app, allowing for an unprecedented level of realism, as well as a challenging enemy A.I. which will push your skills to the limit. The action unfolds both on the strategic and the tactical scale, always demanding teamwork, efficient crew management, and quick situation assessment. Each of the four roles entails unique responsibilities, encouraging the players to develop an efficient communication scheme and use genuine navy terminology. The Captain oversees the compl..
Eenvoudig kaartspel voor het hele gezin. Probeer al je kaarten kwijt te raken en blijf niet met de ezel zitten! De kaarten worden opgedeeld. Als je de ezelkaart hebt, mag je beginnen. Je speelt één of meer kaarten met hetzelfde getal. Daarna mag de volgende speler. Die moet hetzelfde aantal kaarten spelen, maar dan met een hoger getal, of past. Als je de ezelkaart speelt, volgt er een speciale ronde, waarin de speler die de hoogste kaart speelt de kaarten krijgt, inclusief de ezel. De ronde is afgelopen als één van de spelers geen kaarten meer heeft. De spelers die nog wel kaarten hebben, krijgen daar strafpunten voor, waarbij de ezelkaart extra strafpunten waard is. 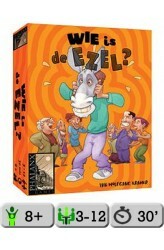 Wie is de Ezel? is een zeer toegankelijk kaartspel, waarin de spelers elkaar uitermate goed dwars kunnen zitten..